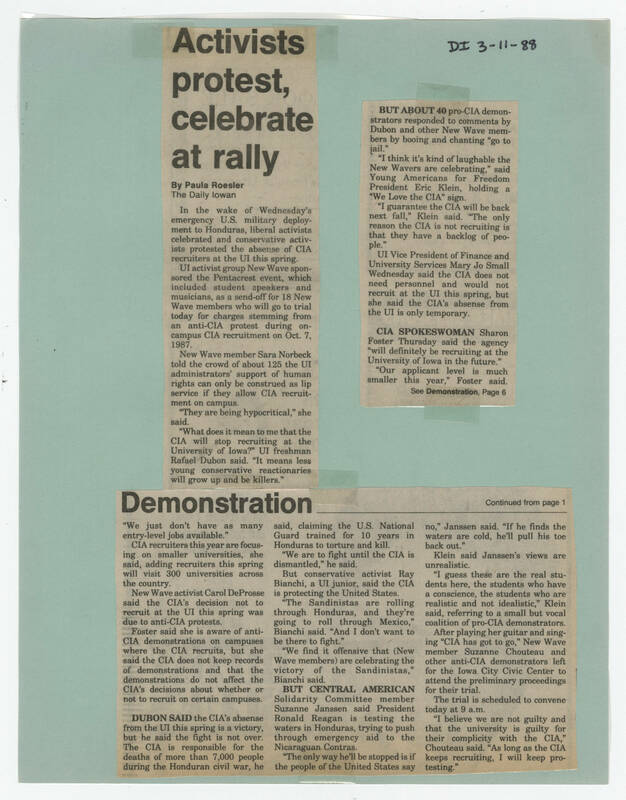 [[Handwriting]] DI 3-11-88 [[First clipping]] [[Header]] Activists protest, celebrate at rally [[End header]] [[bold]] By Paula Roesler [[end bold]] The Daily Iowan [[Article Text]] In the wake of Wednesday's emergency U.S. military deployment to Honduras, liberal activists protested the absence of CIA recruiters at the UI this spring. UI activist group New Wave sponsored the Pentacrest event, which included student speakers and musicians, as a send-off for 18 New Wave members who will go to trial today for charges stemming from an anti-CIA protest during on-campus CIA recruitment on Oct. 7, 1987. New Wave member Sara Norbeck told the crowd of about 125 the UI administrators' support of human rights can only be construed as lip service if they allow CIA recruitment on campus. "They are being hypocritical," she said. "What does it mean to me that the CIA will stop recruiting at the University of Iowa?" UI freshman Rafael Dubon said. "It means less young conservative reactionaries will grow up to be killers. [[bold]]BUT ABOUT 40[[end bold]] pro-CIA demonstrators responded to comments by Dubon and other New Wave members by booing and chanting "go to jail." "I think it's kind of laughable the New Wavers are celebrating," said young Americans for Freedom President Eric Klein, holding a "We Love the CIA" sign. "I guarantee the CIA will be back next fall," Klein said. "The only reason the CIA is not recruiting is that they have a backlog of people." UI Vice President of Finance and University Services Mary Jo Small Wednesday said the CIA does not need personnel and would not recruit at the UI this spring, but she said the CIA's absence from the UI is only temporary. [[bold]]CIA SPOKESWOMAN[[end bold]] Sharon Foster Thursday said the agency "will definitely be recruiting at the University of Iowa in the future." "Our applicant level is much smaller this year," Foster said. See [[bold]]Demonstration[[end bold]], page 6 [[Second clipping]] [[Header]] Demonstration [[end header]] Continued from page 1 [[Article text]] "We just don't have as many entry-level jobs available." CIA recruiters this year are focusing on smaller universities, she said, adding recruiters this spring will visit 300 universities across the country. New Wave activist Carol DeProsse said the CIA's decision not to recruit at the UI this spring was due to anti-CIA protests. Foster said she is aware of the anti-CIA demonstrations on campuses where the CIA recruits, but she said the CIA does not keep records of demonstrations and that the demonstrations do not affect the CIA's decisions about whether or not to recruit on certain campuses. [[Bold]]DUBON SAID[[end bold]] the CIA's absense from the UI this spring is a victory, but he said the fight is not over. The CIA is responsible for the deaths of more than 7,000 people during the Hounduran civil war, he said, claiming the U.S. National guard trained for 10 years in Honduras to torture and kill. "We are to fight until the CIA is dismantled," he said. But conservative activist Ray Bianchi, a UI junior, said the CIA is protecting the United States. "The Sandinistas are rolling through Honduras, and they're going to roll through Mexico," Bianchi said. "And I don't want to be there to fight." "We find it offensive that (New Wave members) are celebrating the victory of the Sandinistas," Bianchi said. [[Bold]]BUT CENTRAL AMERICAN[[end bold]] Solidarity Committee member Suzanne Janssen said President Ronald Reagan is testing the waters in Honduras, trying to push through emergency aid to the Nicaraguan Contras. "The only way he'll be stopped is if the people of the United States say no," Janssen said. "if he finds the waters are cold, he'll pull his toe back out." Klein said Janssen's views are unrealistic. "I guess these are the real students here, the students who have a conscience, the students who are realistic and not idealistic," Klein said, referring to a small but vocal coalition of pro-CIA demonstrators. After playing her guitar and singing "CIA has got to go," New Wave member Suzanne Chouteau and other anti-CIA demonstrators left for the Iowa City Civic Center to attend the preliminary proceedings for their trial. The trial is scheduled to convene today at 9 a.m. "I believe we are not guilty and that the university is guilty for their complicity with the CIA," Chouteau said. "As long as the CIA keeps recruiting, I will keep protesting."